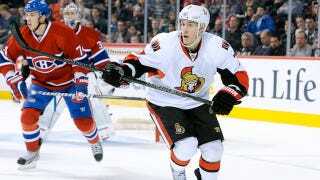 Why Did The Globe And Mail Take Down Its Story About How Kyle Turris Hates Finland? After supposedly "returning" from the Finnish SM-Liiga, Kyle Turris complained about his lockout home to The Globe and Mail, in just the latest of a few such stories to come out recently. The Globe and Mail piece covered the usual stuff: the food sucked, the travel sucked, "they spoke a different language." The article, however, has since been removed. (You can view a screencap below.) According to Turris's agent (via Puck Daddy), it "completely misrepresented Kyle's experience in Finland" and is "erroneous." Turris will supposedly issue a press release via his Finnish team, Karpat Oulu's, website. When we reached out to The Globe and Mail, however, sports editor Tom Maloney claimed that the story was taken down to fix a factual error, and will be republished shortly. But Turris's reported complaints were apparently legit: "The correction is purely about Turris having returned to Canada." So what gives?